The Great Blue Heron measures 42-52 inches high with a wing spread of 6 feet. Sexes appear similar, although the male is slightly larger in size. The bird is recognized by its large grayish-blue body, long legs, long whitish neck, dagger-like bill, and white about the head. 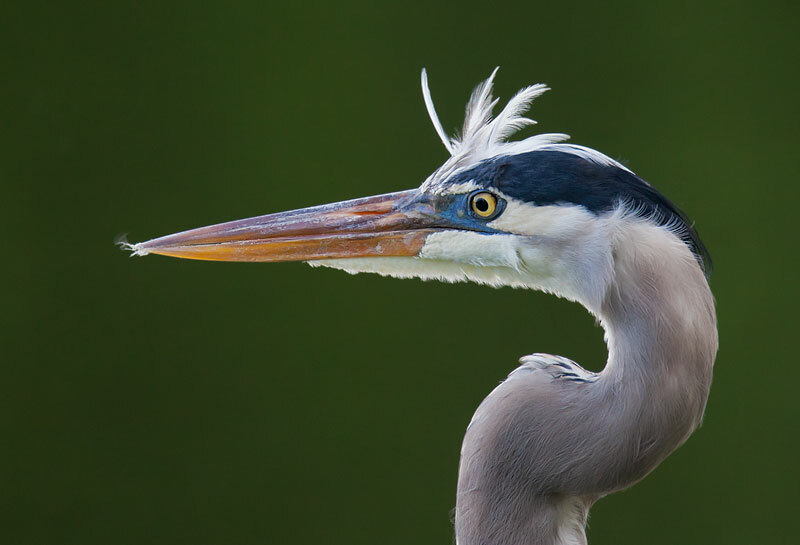 The Great Blue Heron is the largest heron found in Florida. A highly adaptable bird, it is located in a variety of habitats including the Venice Area Audubon Rookery. This bird is commonly observed standing silently along inland rivers or lake shores, or flying high overhead with slow wing beats, its head hunched back onto its shoulders. 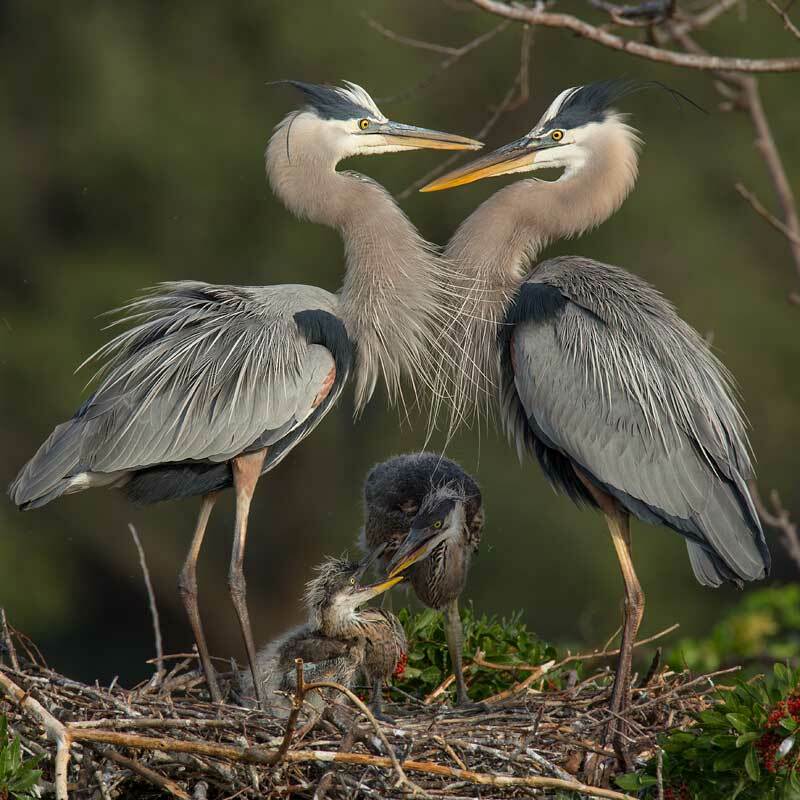 Great Blue Herons nest from November through May. The nest is a large flat platform made of twigs and lined with leaves, grass, fine twigs, and other plant material. The male brings the nesting materials to the female who builds it over 3-14 days. They usually have 3-4 pale greenish-blue eggs and incubation occurs over a 23-26 day period. Both sexes share in nest-sitting chores and in provision of nestling food—mostly regurgitated fish. One of the parents is always present for the first 3-4 weeks. Nesting is usually completed by 4-5 weeks. Young are able to fly short distances at 5 weeks and fly with the adults at 6-8 weeks. The heron’s diet consists mostly of fish but they also consume crustaceans, frogs, salamanders, turtles, snakes, insects, rodents and birds. The heron forages for food by standing or walking in shallow water, waiting for fish to come close, and then catching them with a rapid bill thrust. 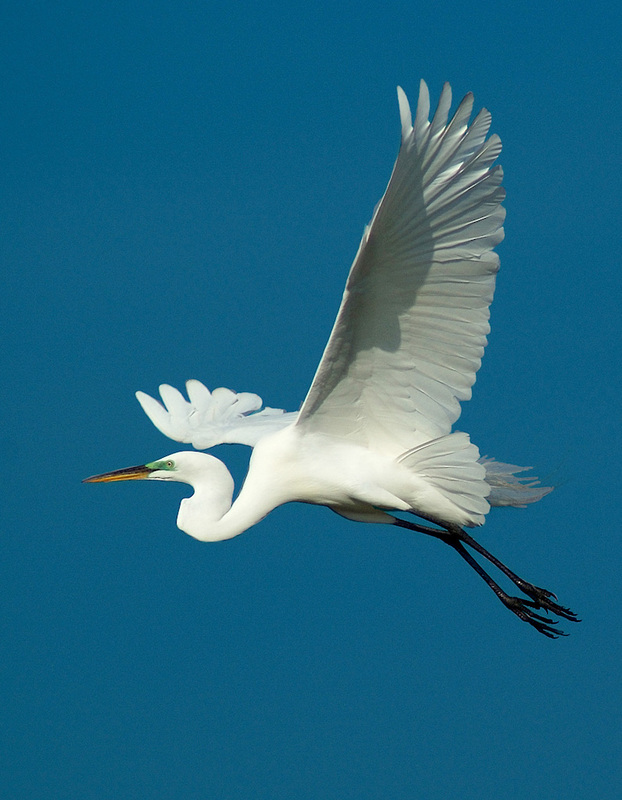 This tall, white, wading bird, called the Great Egret, is found in quiet waters in all seasons throughout Florida. In the past, this beautiful bird was slaughtered for its white plumes that were used to decorate women’s hats. 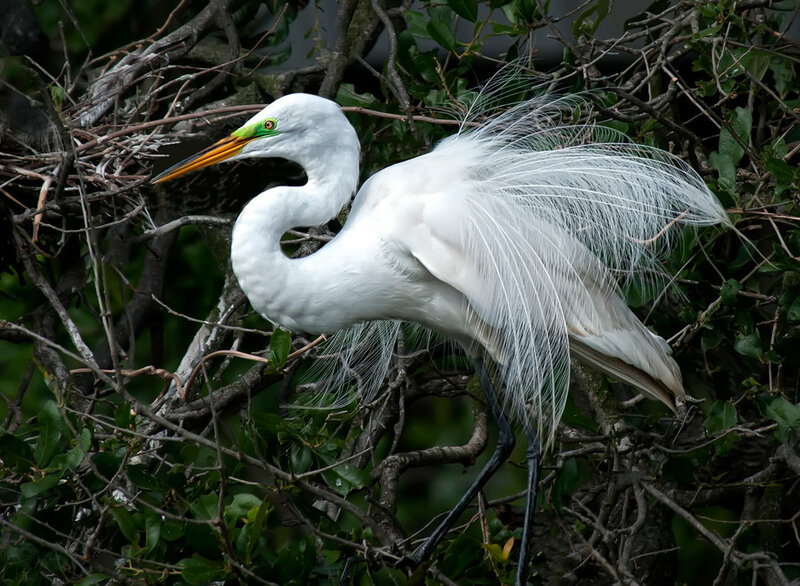 Fortunately, the Great Egret is now a protected species and its population has increased, thanks largely to preserved nesting areas such as the Venice Area Audubon Rookery. The most obvious identifying mark is its size. The Great Egret is the largest white egret—37-41 inches in height, with a 55-inch wingspan. It has a slender white neck with long dark legs, and a bright yellow bill. From January to early summer, both sexes have splendid white breeding plumes growing from their backs. Another sign of a breeding bird is the bright green patch located between the base of the bill and the eye. The egret first breeds at the age of 1-2 years. The male selects the nest area, where he displays his breeding plumage. Initially he drives other birds away, and later courts the females. Courtship displays include calling, circular display flight, and stretching the neck up with the bill pointed toward the sky. Great Egret nesting occurs from December through June. The nest is constructed by both sexes, using sticks arranged on a platform of shrub or tree branches. During incubation the birds perform a ritual nest-relief. The male lands on a nearby branch, with wings raised, then walks toward the nest, his plumes extended. The female responds by lifting her head and spreading her plumes. She departs and the male crouches and slowly settles on the nest. The average 3-4 pale blue-green eggs hatch in 23-26 days. The young usually take their first flight 42 days after hatching. The Great Egret’s diet consists of fish, insects, frogs, snakes, grasshoppers, mice, rats, ducklings, and crayfish. A southern fish-eating water bird, the Anhinga nests along with the herons and egrets at the Venice Area Audubon Rookery. It is about 3 feet in length, has a long sharply-pointed bill for spearing fish, and a long rudder-shaped tail. The male has a long, thin black neck while the female’s neck and breast is a buff color. The birds have silvery wing patches. The immature Anhinga has a brownish neck. When it dives underwater, the Anhinga’s plumage becomes very wet, but the feathers do not lack water proofing oils; rather, the structure of the feathers allows water into the tiny spaces inside them. The result is a loss of buoyancy that helps the Anhinga submerge and forage. After feeding, the Anhinga perches in the sun with its wings spread to dry. It has poor insulating feathers to protect from the cold, so it may keep its wings spread even after dry to maximize heat to warm its body. 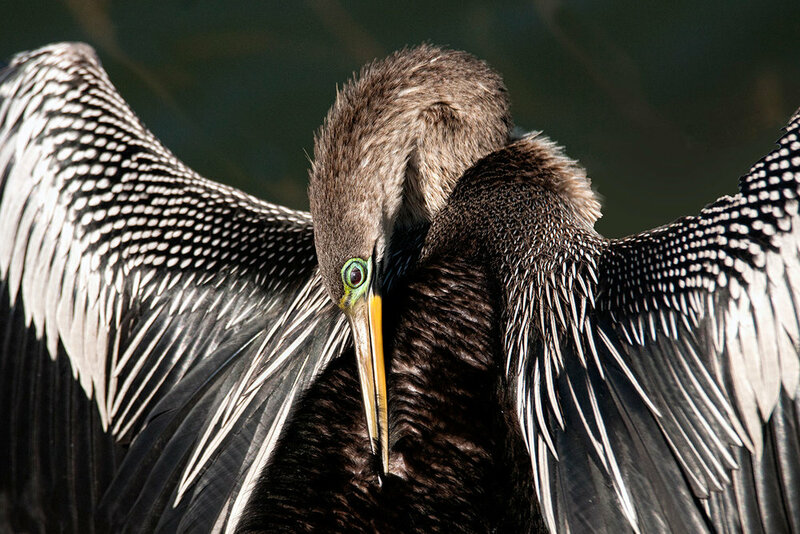 The Anhinga can vary its buoyancy in the water, with only its neck and head protruding, earning it the name Snakebird. When in flight, the Anhinga’s tail may be spread wide as the bird soars high on outstretched wings. During breeding, the bare facial skin and eye of the male become blue-green, and lacy black-and-white plumes appear on the head and neck. At most times, the Anhinga is silent, but around nesting colonies they make various croaking and clicking sounds. Their usual nesting season is March through June. The male brings the nesting materials to the female who uses them to make a small nest, consisting of twigs lined with leafy twigs. There are usually 3-5 eggs that are whitish to pale blue in color. Incubation of about 25 days is performed by both sexes. The young hatch over several days and differ in size. The hatchlings are tended by both parents. After the age of about 2 weeks, if the young are disturbed, they will jump out of the nest into the water, only sometimes being able to return to the nest. The Anhinga dives underwater to hunt for food. Often a solitary bird when feeding, its diet consists mainly of catfish, pickerel, mullet, shad, sunfishes, and occasionally goldfish from outdoor ponds. Also they consume aquatic insects, crayfish, lizards, frogs, water snakes and young alligators. 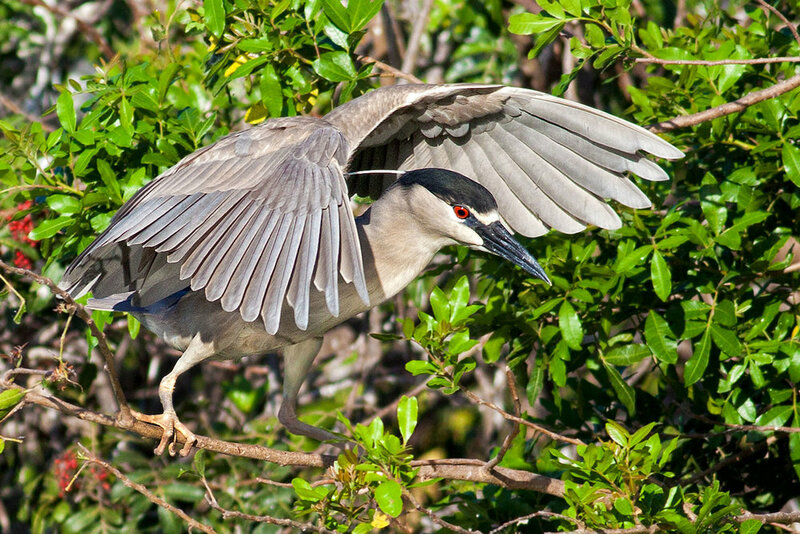 The Black-crowned Night Heron is a stocky, thick-billed, short-legged heron (24 in. ), usually seen hunched and inactive. These herons’ eyes are red with legs that are yellowish or greenish. Adults have black caps in contrast with pale gray or whitish underparts. Breeding birds have two white plumes connected at the crown. The immature night heron is brown streaked and spotted with buff and has a white bill. The voice is a flat “quark” or loud “WOK” that is heard mostly at dusk. The Black-crowned Night Heron is more commonly located near fresh water. It feeds in wet habitats, primarily by standing upright or crouching over a fishing hole, waiting for prey to pass. Although fish is its primary food, these birds also stalk prey by walking slowly and catching snakes, mice, crayfish, crabs and nesting terns. It feeds mainly at dusk. The male gathers the nest material; the female puts the nest together. The pair incubates 3-4 pale green eggs for 21-26 days. Both parents feed the young by regurgitation. The young are able to fly at 6 weeks. A brilliant white, medium-sized heron (24in. ), the Snowy Egret has a slender black bill, black legs and yellow feet, often referred to as golden slippers. During breeding season, the back plumes stand erect for the purpose of attracting a mate. In addition, its yellow lore briefly turns reddish. The voice is a low, raspy sounding note. 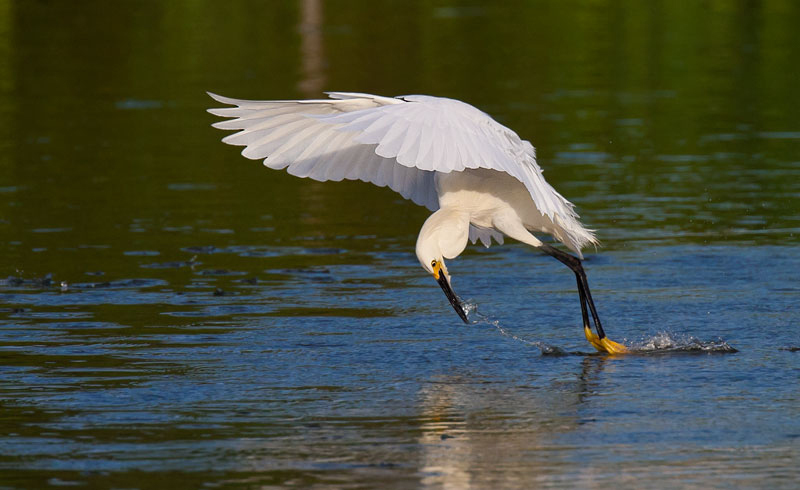 The Snowy Egret uses his yellow feet to stir up mud in shallow water to flush out its prey. It feeds on fish, crabs, crayfish, frogs, snakes, worms and lizards, primarily at sunrise and before sunset. These birds are located mostly in wetland habitats. During the day, it commonly perches in a tree or an elevated area. The Snowy Egret usually nests in trees and tends to breed in colonies, often mixed with other species of wading birds. Males collect the nest material; the females build the nest. Male and female incubate the eggs, 3-5 bluish-green, for 20-24 days. Both parents feed the young. Young leave the nest at 20-24 days. A medium sized white egret (19-20 in. ), stockier and thicker necked than the Snowy Egret. In breeding plumage, both males and females have crowns of buff-orange, and some of that color on their breast and back; little or no buff at other times. The Cattle Egret’s bill appears relatively short and yellow and orange-pink when breeding. Its legs are coral pink when nesting. Juvenile Cattle Egrets are all white and have dark black bills and short black legs and feet. The voice is usually silent. The habitat the Cattle Egret frequents consists of dry grassy upland areas particularly those occupied by grazing animals, also roadside grassy highway center divides, airports and parks. The Cattle Egret does not wade in open water like other egrets. If you see a white egret feeding on dry land or among cattle, it is most likely a Cattle Egret. Originally from Africa, Cattle Egrets were unknown in North America before 1952. They are now abundant over much of the continent. The Cattle Egret’s diet consists of mostly insects stirred up in plowed fields or grass mowing. They also consume frogs, spiders, grasshoppers, crickets, and flies. Cattle Egrets nest in trees or tall shrubs, often in colonies with other herons. They usually have a clutch of 3-4 pale blue eggs. Incubation is by both parents for 21-26 days. The pair feed the young, by regurgitation. The young begin to climb about near the nest at 15-20 days, begin flight at 25-30 days and become independent at about 50 days. The Tricolored Heron is a very slender dark heron (26 in.) with a contrasting white belly and white rump with mostly bluish above and on the neck. The bill is bluish-gray with a black tip. A white stripe follows along the throat to the belly. Tricolored Herons are usually silent. They are more high-strung than most other herons. They often use their wings for balance or extra propulsion when changing position or charging prey. When walking, the head moves in rapid, almost theatrical jabs. It is a solitary feeder, and its diet consists mostly of fish. 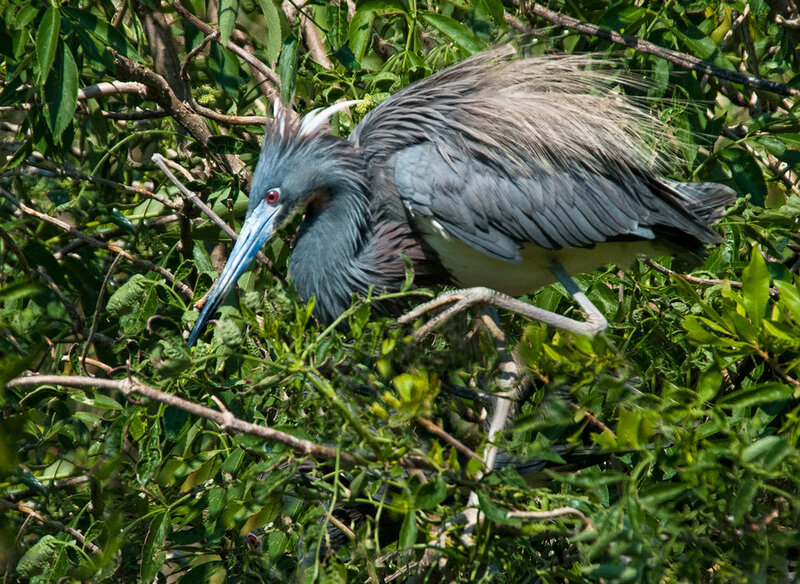 Tricolored Herons usually fish in quiet shallow waters and may be seen wading in belly-deep coastal lagoons. It nests in colonies with other herons and egrets. Males select the nesting site within a colony and display there to attract the female. The display includes neck stretching, deep bowing and circular flight. The nest is built mostly by the female with materials gathered by the male. Incubation is performed by both sexes and lasts 21-25 days. Both parents feed the young.